Whether your venue requires single height portable stages, multiple levels, or entire stage configurations, NPS offers affordable prices, quick ship and superior craftsmanship to provide you with the best value. Combine stages of the same height to construct one large stage , or use progressive heights for seated band or choral riser configurations. Choose from hardboard surface, or carpeted in your choice of blue, black, grey or red. Built with 16-gauge steel frames and premium grade plywood core, these carpeted or hardboard stages are durable and portable. Legs are made with 14-gauge tubular steel and outfitted with springloaded easy to open and close support brackets, for quick set-up and safe use. Portable Seated Riser configurations in ring, oval, or bow styles are put together using multiple stage sets and pie-shaped units are ideal for events that require choir/band participants attention guided to the center. Also great for maintaining an organized appearance at performances and to help facilitate instruction during practice. Guardrails are included for safety. New for 2016: Transfix Stages are 4’x4’ sized platforms that are height adjustable from 16-24” or 24-32”, and roll on caster wheels. Portable Choral Standing Risers are also easy to set up and allow for quick arrangement for all performance venues. Units easily attach to one another to provide multi level heights. Available in both straight and tapered units, allowing for continuous or semi-circle arrangements. The Trans-Port Riser Unit eliminates the need to set up multi level risers. 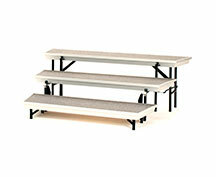 The Trans-Port is a unitized three-level carpeted choral riser that conveniently allows set up in seconds. Unit is outfitted with built in wheels making it easy to transport from room to room and load into a vehicle. Built with 14-gauge legs our unit is strong, safe, and durable. The Trans-Port is built with aluminum frames making it much lighter than a steel frame unit but is just as strong. Multiple units can be connected, using our straight or tapered units to create a variety of configurations. 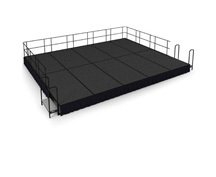 Accessories include stage dollies, steps, guardrails, chair guards and skirting. 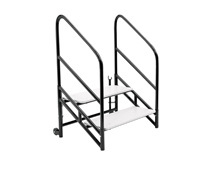 The dolly allows you to conveniently store and transport up to six stages; 36" or 48" from place to place, safely. Built with 14-gauge tubular steel and rolls on four 5" casters. Steps are made of high grade plywood edged in vinyl T-molding. Polypropylene textured grey surface and handrails prevent users from slipping. The black frame is built with 14-gauge steel tubing and clamps securely to the stage at any point. Unit rolls on two wheels for easy setup. Choose one of three convenient heights to match 16", 24", and 32" stage setups. Guardrails are recommended while using any of our stages or risers to ensure safety, and are available in different sizes to accommodate your setup. Black in color, they assemble and install easily. 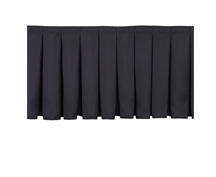 Shirred or box pleat style skirting is available in multiple sizes and colors and includes mating velcro.